The Barellan Masters Games will feature competition in 10 different sports. 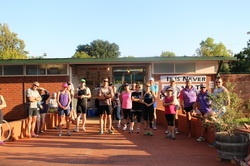 These include: Lawn Bowls, 6 a side Cricket, Netball, Walking, Triathlon, Golf, Horse Challenge, Basketball & Tennis. Entry Fee to the games is $25 which you only pay once, then you add the sport levy for each sport you wish to enter on top of that. Online Entries will be ready by end 2019.